A 1924 article from the Portland Press Herald about conflict between the Industrial Workers of the World and the the Ku Klux Klan. Greenville, Me., Feb. 4 — With the thermometer hovering around the zero mark, about 175 members of the Industrial Workers of the World walked the streets of the town tonight as a result of a clash with local members of the Ku Klux Klan Saturday night. About 40 members of the Klan marched to a local boarding house known as the Lake House, in which several leaders of the I.W.W. were stopping and ordered them to leave town at once or they would use force and put them out. The I.W.W. leaders called to Deputy Sheriff Davis S. Cowan for protection against violence. An officer was placed on guard at the boarding house Saturday night. Sunday and today the I.W.W. delegates as they termed themselves, sent out a call to the lumber camps and today there has been a steady flow of I.W.W. members into this little Maine town. Tonight it was estimated that there were fully 175 I.W.W. members walking the streets. Bob Pease of Bangor, leader of the I.W.W. organization in Maine arrived in town tonight and told the PRESS HERALD representative that he would establish headquarters for the I.W.W. in Greenville. “Why are they against you,” asked the PRESS HERALD representative. 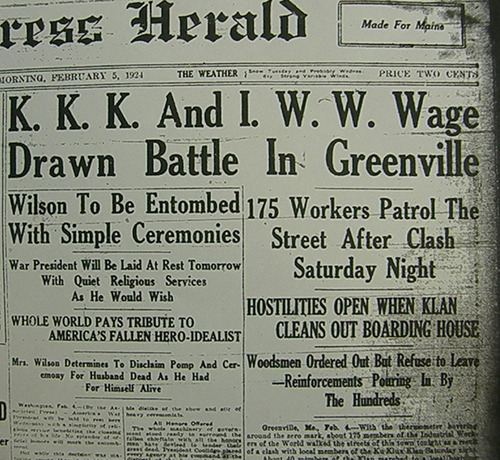 Pease claims that that the Ku Klux Klan in Greenville has been bought by the merchants and the lumber interests. It was understood tonight that the selectmen of the town ordered the I.W.W. members to leave town, but Pease and his men refused, saying they would walk the streets and would build bonfires to keep from freezing. The I.W.W. members were denied admission to any of the local boarding houses and the Y.M.C.A. boarding houses according to Pease. Sheriff Roscoe Macomber from Dover-Foxcroft was here today and placed two of his deputies in charge tonight with instructions to arrest anybody starting trouble. It was said tonight that the Klan members are organizing and the K.K.K.’s leaders have not given up the idea of forcing the I.W.W. men to get out of town. Deputy Sheriff Cowan said late tonight that I.W.W. members from surrounding lumber camps were steadily coming into town and that he expected that several hundred would be here before another twenty-four hours had passed. Pease, the I.W.W. head, said late tonight that he intended to open a branch of his organization in Kingfield, but that headquarters would be established here for the present. He said many of the men in his organization were French Catholics. That's so cool! Thanks for sharing this article!